Norwegian Elkhound Temperament (Bold, Strong-Willed) Can You Handle? Norwegian Elkhound Temperament (Bold, Strong-Willed): Can You Handle It? The Norwegian Elkhound temperament makes him a great watchdog and a dog that can withstand many challenges. 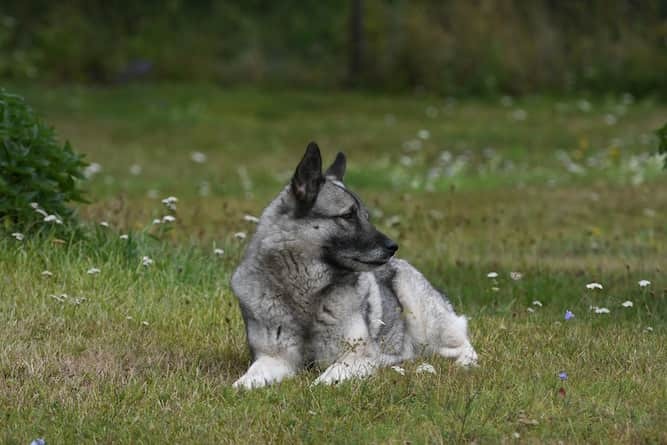 Keep reading for a list of Norwegian Elkhound pros and cons to help you decide whether to bring this tough, lovable dog home. Quick Fact: In medieval times, Norwegians called the Norwegian Elkhound a dyrehund, which translates to “animal-dog” in Norwegian. This is presumably because he was used as a hunter's dog. He may hold back a bit around strangers, but if he knows you, he’ll shower you with passionate greetings. He thinks nothing of jumping right up on friends and family to lick their faces. He won’t hold back about chasing after smaller animals because he thinks they’re prey. So if you already have cats or other small animals as pets, this dog is probably not for you. This dog comes from the freezing cold winters of Norway, so he knows what it’s like to face harsh weather. He is also a hunter by nature, so he can spend days in the woods, hunting big game like moose, without feeling any effects. His hunting instincts make him a great watchdog. He knows which territory is his to protect, and he won’t think twice about barking until the threat goes away. He is incredibly loyal to his family and fiercely protects them with his life. However, it is not recommended to have him in a home with younger children. Older children, or preferably homes with no children at all, are a much better fit for him. He is a bundle of energy, always waiting for the right time to unleash it. You must be a strong leader with a Norwegian Elkhound or he will learn your weaknesses and push you around. Another trait to note about this breed is his tendency to bark…and bark he does. This is because he uses his bark to tell the hunter where he is and that he has cornered his prey. Because he barks so much, you may think to yourself “are Norwegian Elkhounds aggressive?” But he is only aggressive with prey, else he will just annoy the neighbors until you can train him out of excessive barking. As far as training the Norwegian Elkhound, he learns quickly, but he gets bored easily. He’s like a kid in school. Once he’s learned it, he’ll give you that “haven’t we already done this?” kind of look. His hunting nature makes him very independent. However, independence is a challenge when trying to train him. He may decide that what you’re trying to teach him is not nearly as interesting as what’s going on in the corner of the yard. To help you prepare for the fun and challenge of training you Norwegian Elkhound take a look at these FREE Dog Training Videos. As far as colors go for the Norwegian Elkhound, black is normal around the tips of his ears and tail, while the rest of him is silver-gray. This is a beautiful dog and proper grooming will help keep him looking at his best. For the Norwegian Elkhound, shedding is practically a sport. He’s one of those dogs that has a top coat and an undercoat. The undercoat sheds more than the top coat. When it’s shedding season, you will see balls of hair rolling about your house. To combat this, spend five minutes a day “back-brushing” him. This means brushing his coat in the opposite direction that it lays flat. Spend about two minutes a day giving him touch-up brushings, and you’ll save your carpet – and your vacuum cleaner – a lot of trouble. You only need to bathe him two or three times a year. This is because he doesn’t get that “wet dog” smell due to the kind of coat he has. You need to be careful when exercising the Norwegian Elkhound that you don’t give him too much freedom. He loves being out in the open air, and his hunter nature can encourage him to take off after a scent. Don’t let him off of his leash on walks. Between his natural instincts and his stamina, he could be gone for days before he realizes he’s lost. Most Norwegian Elkhounds love swimming from their days of tracking moose through the water. Swimming is, therefore, a great way to exercise these dogs. The typical Norwegian Elkhound size is about 19 to 20 inches tall and between 49 and 55 lbs. The Norwegian Elkhound's life expectancy is between 12 and 15 years. Most Norwegian Elkhound puppies are healthy, but any dog can develop a health problem. Note: The Ultimate Guide to Dog Health is a great health resource to have at home. It will help you spot symptoms of these terrible health issues early saving you time, money and anguish. So you've decided to add a Norwegian Elkhound puppy to your family. Congrats! Norwegian Elkhound dogs are available for sale either through a breeder or from a rescue or adoption agency. The price of a Norwegian Elkhound can vary, depending on the method you use to purchase one. The average Norwegian Elkhound price is around $500. The price of the dog may vary, depending on who you get it from and the rarity of the breed. Some Norwegian Elkhound puppies can cost as much as $700. If you want to adopt a Norwegian Elkhound puppy, check with your local rescue or adoption organizations. The costs involved with adopting a Norwegian Elkhound will always be less than purchasing a puppy from a breeder. If you’d like to adopt a Norwegian Elkhound rescue, you can give a great home to a dog who has been through some tough times. Note that most dogs available for adoption may be closer to a Norwegian Elkhound mix. There’s nothing wrong with this, though it may be difficult to get a good read on the dog’s history. This is because people find or put up dogs for adoption without providing additional information about the dog. If adoption seems too risky because you’re not sure what you’ll get, you can purchase a Norwegian Elkhound from a breeder. Check out The Norwegian Elkhound Association of America. Their website features a breeders directory, where you can start making your list and comparing their qualities. You should do your homework when it comes to picking a breeder. Don’t spend hundreds of dollars with someone that you can’t be sure is aboveboard. The Norwegian Elkhound is a hunter by nature, and it’s a job he takes very seriously. For this reason, you can’t have other small animals in the house with him. It’s also not a good idea to have him around younger children. He barks a lot. So, if you live in a neighborhood where this could be a problem, you’ll need to train him out of the habit. Training a Norwegian Elkhound can be tricky because he is so independent. You must establish early on that you are the leader, else he will walk all over you. You must brush him every day, but you only need to bathe him two or three times a year, thanks to the quality of his coat. Previous post: Miniature Bull Terrier Temperament (Fearless, Protective, Energetic): Can You Handle It?